The Youth are also “Egg”static and looking forwarding to “Hopping” right into church and local missions in the month of April. April 10, the Youth will be blanketing our surrounding housing additions with door hangers, inviting our neighbors to come and participate in our Palm Sunday Funday and Easter Services. April 13, the Youth will once again have the opportunity to travel into Tulsa and participate in Asbury United Methodist’s Second Sunday Activities, ranging from working in food pantries to learning how to make blankets for the homeless using recycled plastic bags. April 14 is Palm Sunday Funday. The Youth will be helping with the activities and as a treat, Ms. Jena Barber, Director of Children’s Ministries will be setting up a Youth scavenger hunt for us to be held Wednesday, April 17. 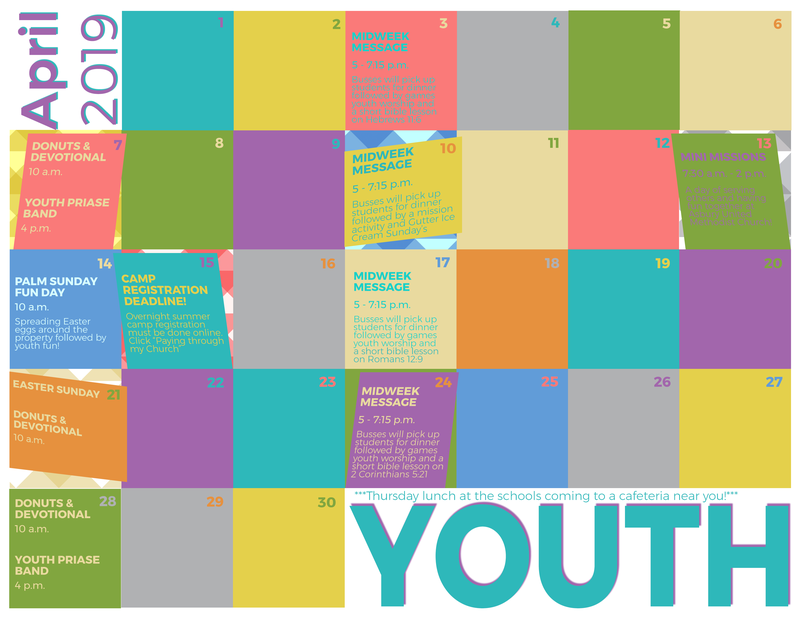 Download the April Youth Calendar HERE!